Annan followed up their victory over Hamilton in the Betfred Cup with a convincing 4 goal victory over Berwick at Galabank on Tuesday evening. 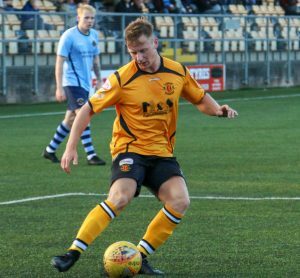 The win pushes Annan to the top of their group after Hamilton and Livingston were deadlocked in a goalless draw with Livingston winning the penalty shoot out to earn a bonus point. Scott Hooper sets up the final goal. The Annan line up showed one change with Peter Watson taking the place of the injured Steven Swinglehurst at the centre of the Annan defence. Annan were never in any trouble as they completely outplayed Berwick and after former Dalbeattie Star striker Tommy Muir headed Annan ahead from Chris Johnston’s corner in the 32nd minute there was never any doubt that Annan would prevail. Chris Johnston was a constant threat down the left all evening and as the game approached half time the little winger picked out Tommy Muir who brilliantly skipped past the challenge of Wilson to finish with a superb low shot past Adams to give Annan a two goal interval advantage. Any hopes that Berwick would turn the match around were blown away in the 48th minute when the impressive David Wilson hit an absolute screamer into the top corner of the net from 20 yards to give Annan a 3 goal advantage. Five minutes later Annan completed the scoring when Scott Roberts put the final touch to a well worked move when Annan’s slick passing unlocked the Berwick defence with Roberts slipping the ball into the corner of the net from 8yards. It was one way traffic and Berwick had keeper Alasdair Adams to thank for some fine goalkeeping when he pulled off two point blank saves to deny Annan’s man of the match Chris Johnston. Annan’s next match is against Kenny Millers Livingston at Prestonfield the home of Linlithgow this Saturday, KO 3-00PM . It is another tough ask for Peter Murphy’s team but the way they have won their opening 2 Betfred Cup ties gives them real optimism and belief that they are capable of pulling off another shock result. Annans final Betfred Cup tie is against Airdrie on Tuesday evening KO 7-45PM. Annan – Alex Mitchell, Scott Hooper, James Creaney, David Wilson (Owen Moxon 67 min), Peter Watson, Ayrton Sonkur , Tony Wallace, Tommy Muir ( Aidan Smith 60 min) , Scott Roberts, Chris Johnston. Subs not used Robbie Minto, Steven Swinglehurst Peter Murphy. Berwick Rangers – Alasdair Adams, Joran Orru, Robert Wilson, Jamie Todd, Darren Lavery (Jamie Chapman 75 min), Aaron Murrell (Oliver Fleming 70 min),Paul Willis, Gary Phillips, Jack Cook, Sean Murphy, Jed Davie (Daryl Healy ht). Subs not used Sean Brennan , Grant Rose, Marc Molloy. Referee – Duncan Williams Assistants – Brian Templeton and Keiron Traynor.